If you’re wondering whether the new Laser Bounce location in Atlas Park is appropriate for toddlers then the answer is a resounding YES! We decided to visit the newly opened location during mid-winter recess to check it out and RJ had a BLAST! Laser bounce features a HUGE Ballocity Arena which gives the kids a chance to propel, throw, dump and vacuum foam balls. The arena is multi-level and features a huge variety of blasters, vacuums and even has a slide. There are literally hundreds, if not thousands of balls in the arena and there was plenty of space to run around. Some of the vacuums/blasters were a little loud and RJ was startled initially but he got used to it pretty quickly. The Bounce Arena had multiple bouncy houses including a basketball themed bounce house and a huge inflatable wack-a-mole. Anyone that knows RJ knows jumping is his THING. 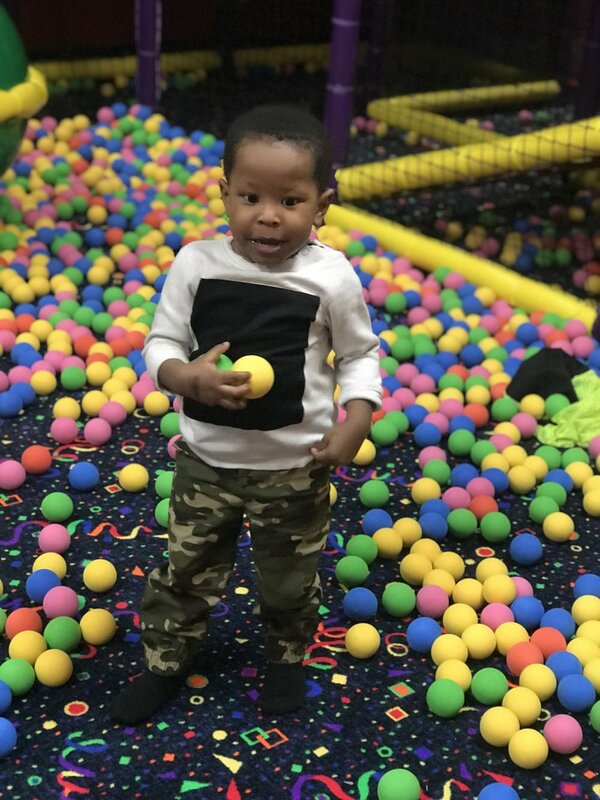 He wanted to stay in the bounce arena for a lot longer but we wanted to make sure he tried out multiple areas of the arcade since we purchased the package that also included arcade credits, highway 66 bowling and the ballocity and bounce arenas for $20. I didnt get to take that many additional photos because once RJ wasn’t in a confined area he was OUT! Luckily for us we went on a day that wasn’t super crowded and I suspect it was because not many people realized the location was open yet but its been a few weeks since then and I’m sure word has definitely spread. Luckily, the do split up the time in the Ballocity and Bounce Arena into sessions so that it’s not a free for all and I’m sure that reduces the crowding in the areas. All in all this location has a wide array of things to do and they have packages that are priced amazingly! I can’t wait to take RJ back. It’s definitely a great place to have your littles burn off some energy and enjoy a nice quiet car ride home. For more information on Laser Bounce at Atlas Park feel free to visit their website here. Disclaimer: This post is not sponsored in any way. I used my own coins to pay for our package and am simply giving an honest review based on our experience at this location. I definitely can’t wait to check them out again!